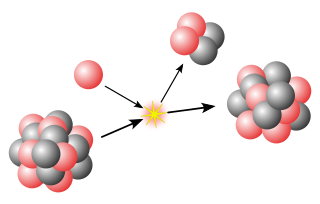 Neutron capture plays an important role in the cosmic nucleosynthesis of heavy elements. In stars it can proceed in two ways: as a rapid (r-process) or a slow process (s-process). Nuclei of masses greater than 56 cannot be formed by thermonuclear reactions (i.e. by nuclear fusion), but can be formed by neutron capture. Neutron capture on protons yields a line at 2.223 MeV predicted  and commonly observed  in solar flares. 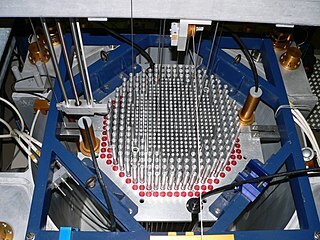 The rapid neutron-capture process, or so-called r-process, is a set of nuclear reactions that in nuclear astrophysics is responsible for the creation (nucleosynthesis) of approximately half the abundances of the atomic nuclei heavier than iron, usually synthesizing the entire abundance of the two most neutron-rich stable isotopes of each heavy element. Chemical elements heavier than iron typically are enabled by the force between nucleons to be capable of six to ten stable isotopic forms having the same nuclear charge Z but differing in neutron number N, each of whose natural abundances contribute to the natural abundance of the chemical element. Each isotope is characterized by the number of neutrons that it contains. The r-process typically synthesizes new nuclei of the heaviest four isotopes of any heavy element, being totally responsible for the abundances of its two heaviest isotopes, which are referred to as r-only nuclei. The most abundant of these contribute to the r-process abundance peaks near atomic weights A = 82, A = 130 and A = 196. The slow neutron-capture process or s-process is a series of reactions in nuclear astrophysics that occur in stars, particularly AGB stars. The s-process is responsible for the creation (nucleosynthesis) of approximately half the atomic nuclei heavier than iron. At small neutron flux, as in a nuclear reactor, a single neutron is captured by a nucleus. For example, when natural gold (197Au) is irradiated by neutrons, the isotope 198Au is formed in a highly excited state, and quickly decays to the ground state of 198Au by the emission of γ rays. In this process, the mass number increases by one. This is written as a formula in the form 197Au+n → 198Au+γ, or in short form 197Au(n,γ)198Au. If thermal neutrons are used, the process is called thermal capture. The neutron flux is a scalar quantity used in nuclear physics and nuclear reactor physics. It is the total length travelled by all free neutrons per unit time and volume. Equivalently, it can be defined as the number of neutrons travelling through a small sphere of radius in a time interval, divided by and by the time interval. The usual unit is cm−2s−1. The isotope 198Au is a beta emitter that decays into the mercury isotope 198Hg. In this process the atomic number rises by one. The r-process happens inside stars if the neutron flux density is so high that the atomic nucleus has no time to decay via beta emission in between neutron captures. The mass number therefore rises by a large amount while the atomic number (i.e., the element) stays the same. Only afterwards, the highly unstable nuclei decay via many β− decays to stable or unstable nuclei of high atomic number. The absorption neutron cross-section of an isotope of a chemical element is the effective cross sectional area that an atom of that isotope presents to absorption, and is a measure of the probability of neutron capture. It is usually measured in barns (b). A barn is a unit of area equal to 10−28 m2 (100 fm2). Originally used in nuclear physics for expressing the cross sectional area of nuclei and nuclear reactions, today it is also used in all fields of high-energy physics to express the cross sections of any scattering process, and is best understood as a measure of the probability of interaction between small particles. A barn is approximately the cross-sectional area of a uranium nucleus. The barn is also the unit of area used in nuclear quadrupole resonance and nuclear magnetic resonance to quantify the interaction of a nucleus with an electric field gradient. While the barn is not an SI unit, the SI standards body acknowledges its existence due to its continued use in particle physics. Absorption cross section is often highly dependent on neutron energy. As a generality, the likelihood of absorption is proportional to the time the neutron is in the vicinity of the nucleus. The time spent in the vicinity of the nucleus is inversely proportional to the relative velocity between the neutron and nucleus. Other more specific issues modify this general principle. Two of the most commonly specified measures are the cross-section for thermal neutron absorption, and resonance integral which considers the contribution of absorption peaks at certain neutron energies specific to a particular nuclide, usually above the thermal range, but encountered as neutron moderation slows the neutron down from an original high energy. The thermal energy of the nucleus also has an effect; as temperatures rise, Doppler broadening increases the chance of catching a resonance peak. In particular, the increase in uranium-238's ability to absorb neutrons at higher temperatures (and to do so without fissioning) is a negative feedback mechanism that helps keep nuclear reactors under control. 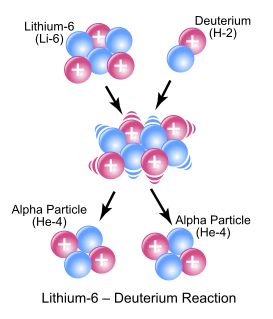 Neutron capture is involved in the formation of isotopes of chemical elements. As a consequence of this fact the energy of neutron capture intervenes in the standard enthalpy of formation of isotopes. Neutron activation analysis can be used to remotely detect the chemical composition of materials. This is because different elements release different characteristic radiation when they absorb neutrons. This makes it useful in many fields related to mineral exploration and security. The most important neutron absorber is 10 B as 10B4C in control rods, or boric acid as a coolant water additive in PWRs. Other important neutron absorbers that are used in nuclear reactors are xenon, cadmium, hafnium, gadolinium, cobalt, samarium, titanium, dysprosium, erbium, europium, molybdenum and ytterbium;  all of which usually consist of mixtures of various isotopes—some of which are excellent neutron-absorbers. These also occur in combinations such as Mo2B5, hafnium diboride, titanium diboride, dysprosium titanate and gadolinium titanate. Hafnium, one of the last stable elements to be discovered, presents an interesting case. Even though hafnium is a heavier element, its electron configuration makes it practically identical with the element zirconium, and they are always found in the same ores. However, their nuclear properties are different in a profound way. Hafnium absorbs neutrons avidly (Hf absorbs 600 times more than Zr), and it can be used in reactor control rods, whereas natural zirconium is practically transparent to neutrons. So, zirconium is a very desirable construction material for reactor internal parts, including the metallic cladding of the fuel rods which contain either uranium, plutonium, or mixed oxides of the two elements (MOX fuel). Hence, it is quite important to be able to separate the zirconium from the hafnium in their naturally occurring alloy. This can only be done inexpensively by using modern chemical ion-exchange resins. Similar resins are also used in reprocessing nuclear fuel rods, when it is necessary to separate uranium and plutonium, and sometimes thorium. A beta particle, also called beta ray or beta radiation, is a high-energy, high-speed electron or positron emitted by the radioactive decay of an atomic nucleus during the process of beta decay. 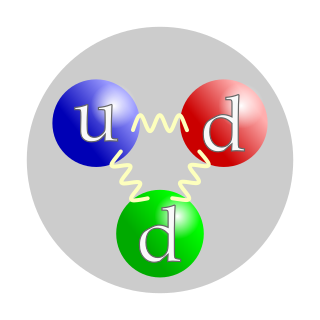 There are two forms of beta decay, β− decay and β+ decay, which produce electrons and positrons respectively. 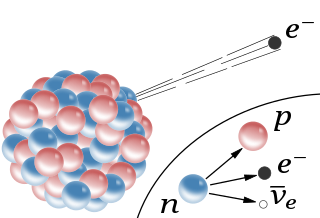 Neutron activation is the process in which neutron radiation induces radioactivity in materials, and occurs when atomic nuclei capture free neutrons, becoming heavier and entering excited states. The excited nucleus often decays immediately by emitting gamma rays, or particles such as beta particles, alpha particles, fission products, and neutrons. Thus, the process of neutron capture, even after any intermediate decay, often results in the formation of an unstable activation product. Such radioactive nuclei can exhibit half-lives ranging from small fractions of a second to many years. In nuclear and particle physics, the concept of a neutron cross section is used to express the likelihood of interaction between an incident neutron and a target nucleus. In conjunction with the neutron flux, it enables the calculation of the reaction rate, for example to derive the thermal power of a nuclear power plant. The standard unit for measuring the cross section is the barn, which is equal to 10−28 m2 or 10−24 cm2. The larger the neutron cross section, the more likely a neutron will react with the nucleus. A nucleogenic isotope, or nuclide, is one that is produced by a natural terrestrial nuclear reaction, other than a reaction beginning with cosmic rays. The nuclear reaction that produces nucleogenic nuclides is usually interaction with an alpha particle or the capture of fission or thermal neutron. Some nucleogenic isotopes are stable and others are radioactive. 1 2 3 4 Ahmad, Ishfaq; Hans Mes; Jacques Hebert (1966). "Progress of theoretical physics: Resonance in the Nucleus". Institute of Physics. 3 (3): 556–600. ↑ Morrison, P. (1958). "On gamma-ray astronomy". Il Nuovo Cimento. 7 (6): 858–865. Bibcode:1958NCim....7..858M. doi:10.1007/BF02745590. ↑ Chupp, E.; et al. (1973). "Solar Gamma Ray and Neutron Observations". NASA Special Publication. 342: 285. Bibcode:1973NASSP.342..285C. ↑ D. Franklin; R. B. Adamson (1 January 1984). Zirconium in the Nuclear Industry: Sixth International Symposium. ASTM International. pp. 26–. ISBN 978-0-8031-0270-5 . Retrieved 7 October 2012.